Over the past couple of years, Blue and I have had a few ups and downs. 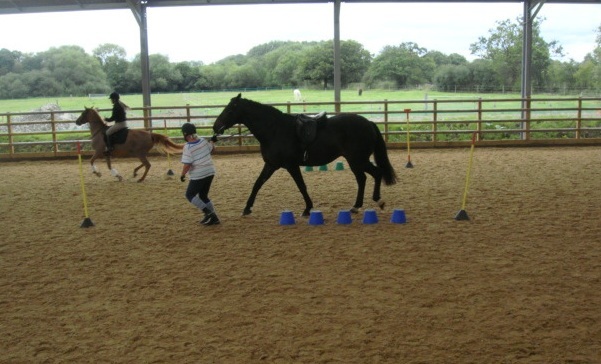 We managed to sort out her back, my back and the saddle, and started on an intensive programme of schooling, designed to strength her muscles and help her re-balance. The results have been very satisfying, and she’s now a completely different shape to when we started. In fact, I was looking at her this morning as she chased that elusive last carrot round her feed bucket – a tubby, relaxed pony, dappled and shining with good health – and couldn’t believe she was the same horse we’d started with. I’m getting such good results with the schooling that it’s tempting to forget that she sometimes needs to kick back and relax a bit. We hack a lot, but I’m using these times as impromptu schooling sessions, and often end up leg yielding back and forth across the road, if there’s no traffic. If I’m tempted to get too serious, I try and remember that it’s all about having fun, for both of us. That’s why I’m looking forward to this year’s Summer Camp, organized by New Barn Riders. 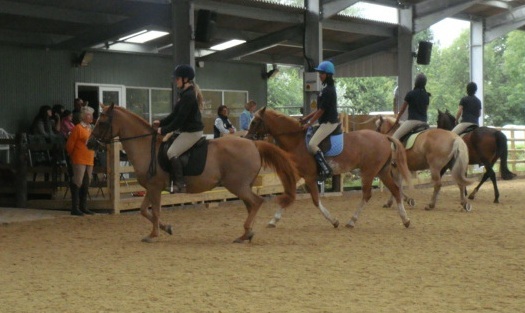 Last year’s camp – the inaugural event – saw 12 riders, on a range of very different horses and ponies, try a range of new activities. For two days, we played silly gymkhana games, organised quadrille rides and generally behaved as though we were still in Pony Club. Apart from anything else, I was amazed by how competitive everyone got over the games! The horses – which included a Fjord, several warmbloods, a retired games pony and a Welsh cob – loved the camp, without exception. 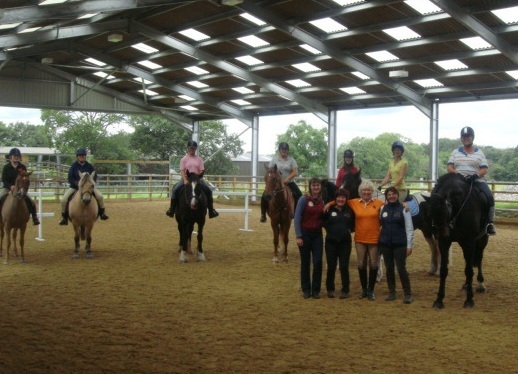 Again, another surprise was how well some of the big competition dressage horses took to bending races and apple bobbing! Blue was in her element, being small, fast and quick on her toes – our team, of course, won. The great advantage of gymkhana games – apart from the way they make you instantly regress to your childhood – is how easy they are to set up at home. Bending races can be practised with a row of traffic cones or bamboo stakes for markers; apple bobbing needs only a bucket of water and an apple. Many of the games need no equipment at all – but all are great for improving flexibility, reaction time and coordination. This year’s camp is due to feature Western riding and agility demos. Our names are down already. The organizers and some of the attendees at the 2011 event. Oh yes. And another tip is that it’s very useful to have a 14.3hh pony, when you’re competing against a lot of riders on 16.2hh horses! Very funny to see a lot of serious dressage riders getting het up because they couldn’t get on and off quickly enough to pass the relay baton. In fact, I think we all spent the whole weekend in absolute hysterics.